← Get Your Teen Reading! 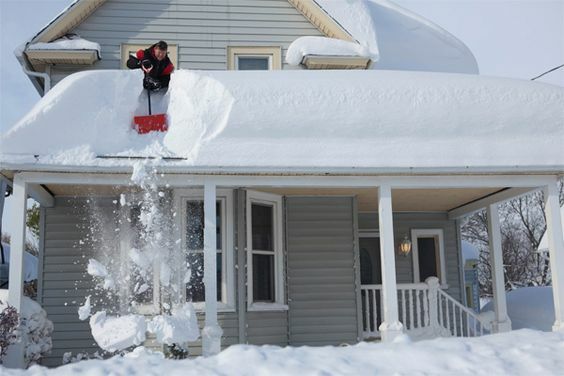 Depending on where you live, the term “roof snow removal” might be of little concern to you, or, it might very well send a shiver down your spine in a way no wintery blast of arctic air ever could. If the latter is true, you likely live in an area with heavy annual snowfall and the thought of two or three feet of wet, heavy snow piled high on your roof is one you’d perhaps rather not think about. Many homeowners simply endure winter; they allow snow to fall where it may, not necessarily unaware of the damage and strain a roof full of snow can put on their home’s structure but perhaps unsure how to go about it. For those who don’t know, there are two very good reasons to make sure your roof is as snow free as possible this winter. Failing to remove the snow from your roof is an open invitation to the formation of ice dams. Ice dams occur when snow melts then refreezes at the edge of your roof. Over time, the mass of ice can grow, preventing water from draining properly. This water can then permeate your roof, damage shingles, walls, ceilings, and insulation. Simply put, the absence of snow on your roof prevents the development of ice dams and all the bad stuff that comes with them. The second problem has to do with the impact that the excess weight that snow adds to your home’s supports. To give a bit of context, a one-inch layer of snow spread out over a square foot weighs about one pound. Consider then the weight that twelve or eighteen inches of snow can add over the entirety of your roof; staggeringly, the extra weight added can easily be in the hundreds if not thousands of pounds. In all honesty, no one is going to be out inspecting their roof with every dusting of the white stuff. That being said, if your home has a disproportionately larger number of icicles hanging from its edges than the bulk of the neighbourhood, there’s a good chance ice dams have already formed on your roof and it’s worth looking into. Likewise, if you notice that the weather has been fluctuating wildly from one day to the next the rapid thawing and freezing of water could also be haranguing your roof, even if you can’t make a visual confirmation. Of course, if temperatures and accumulation remain constant, more than a foot of accumulated snow can really compromise your roof’s integrity. Okay, So the Danger is Real – What Can Be Done About it? Thankfully, there are a number of snow removal alternatives that can help you make sure your roof stays in one piece this winter. Heat wires are a very common remedy to the snow removal problem. Essentially, heat wires are placed up and down a roof and melt the snow via electrical current. While popular, there are a couple of reasons why heat wires aren’t the best solution. First, they use a relatively large amount of energy and never really solve the root problem: too much snow on the roof. Depending on how often it’s required, heat wires can add a significant amount to your monthly utility bills (and let’s face it, they’re high enough as it is in the winter, aren’t they?). The second problem is that while heat wires melt the snow, it can simply refreeze and, at the risk of sounding like a broken record, this can cause the formation of an ice dam. Roof-raking is an easy to perform task that lets you, the homeowner, take control of the removal of snow from your roof. As far as alternatives go, it’s much more economical than having someone install heat wires on your home (the life expectancy for heat wires by the way is only around five years on the high end), or paying someone to clear off your roof for you. As good as it is, raking does have its limitations. For example, if you live in a two story home, a snow rake won’t be able to clear off your roof in its entirely the way it would if you lived in say a bungalow. Raking is also best for light to moderate accumulation. If there’s too much snow for the rake to handle, it’s time to get out the shovel. Likewise, if the snow is too heavy or dense for your rake, or if your home has multiple story’s the shovel is going to be your best bet provided you can do so safely. Do your best to not compact the snow. When you’re up on the roof, take special care to avoid using the same path. The more you step in the same spot, the more you compact the snow. Eventually, this can turn to ice and actually help an ice dam to form. Do rake your roof with every six inches of snowfall. Do be mindful of overhead power lines.